The metal used most in this period was bronze, which is a mixture of 90% copper and 10% tin. Tin was found in streams in Cornwall and copper was mined in surface workings or in deep underground mines, at places like the Great Orme in North Wales (the largest in northern Europe). Bronze is much harder than just pure copper and could be poured into moulds to make tools like: axes, spears and daggers. As the population of Britain grew, settled communities of people started to appear. 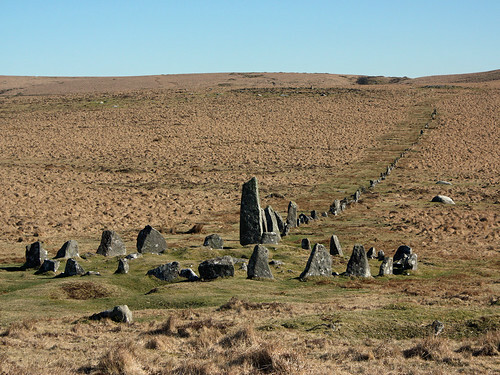 Farming became important as more food was needed and huge areas of forest were cleared to create the first proper fields, divided up with drystone walls - the Dartmoor reeves (field boundary banks) are the best examples of this in Britain. Roads and trackways were also improved and wheeled, animal-drawn vehicles began being used too. 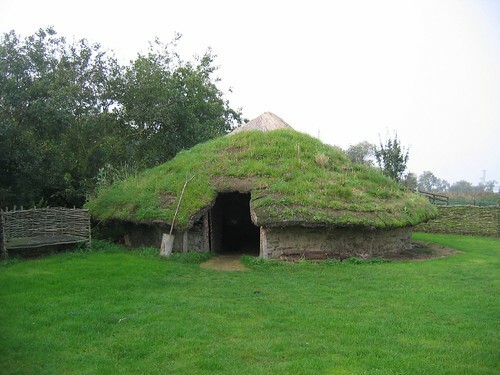 Houses in the Bronze Age were usually built in a round shape using natural materials and had a hearth (fire) in their center for: warmth, light and cooking. Grass was sometimes grown on the roof to help insulate it. Stonehenge in Wiltshire - whose stones were aligned so that the rising sun could be seen perfectly between them on the summer solstice each year, possibly to help the people mark the passing of the seasons. People also held religious ceremonies in: rivers, bogs and fens. At Flag Fen, bronze objects, including jewellery, have been found deposited as offerings to the Gods.